In connection with the recent announcement of the construction of three wetfish trawlers for HB Grandi, the Icelandic fishing concern, MAN Diesel & Turbo has announced that the newbuildings’ MAN main engines will also feature its SCR (Selective Catalytic Reduction) system. The company states that the system will enable the trawlers’ IMO Tier II-compliant engines to fulfil the strict IMO Tier III NOx emission requirements. Vilhjalmsson added that HB Grandi deliberately pursues a green company profile and that its focus on clean and responsible fishing ultimately led to MAN technology being chosen for the trawlers. As such, HB Grandi’s profile suited the minimal environmental footprint from operations, including the cleaner exhaust gasses and NOx reduction that the MAN package offers. A further advantage of choosing MAN was the relatively straightforward integration of engine, propeller, propulsion controls and SCR system that equipment from the same manufacturer entails. MAN Diesel & Turbo reports that special attention was given to selecting the optimal position for the SCR system aboard the trawler. This challenge was met and solved in great part through good cooperation with Nautic, the Icelandic specialist designer and ship consultant, at an early stage of the project. 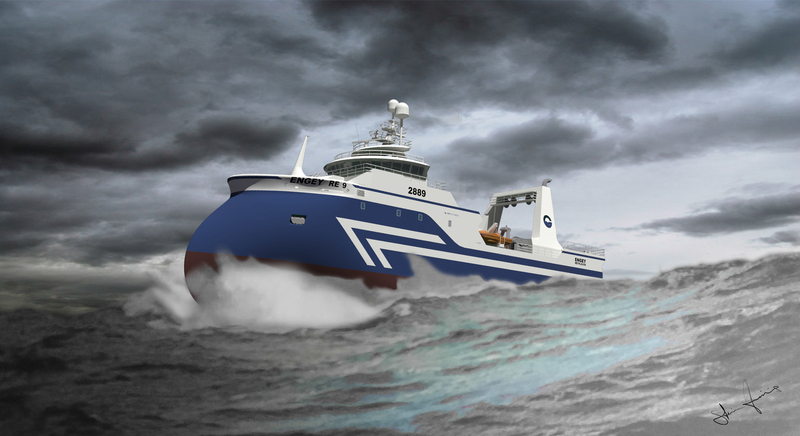 Nautic – based in Reykjavík – is designing the new vessels, which will replace three wetfish trawlers currently in service. The vessels, with their distinctive bows, will be built in Turkey by Celiktrans Deniz Ltd. Sti. with delivery scheduled for May 2016, late-2016 and spring 2017, respectively. The new HB Grandi wetfish trawlers will enjoy the benefit of several features to optimise operation. These include employing a floating-frequency concept that increases their flexibility and economical part-load pattern with an up to 17% lower engine/propeller speed and a commensurately lower fuel consumption. MAN Diesel & Turbo’s new, advanced Alphatronic 3000 generation propulsion-control system will also be installed aboard the trawlers and, among other characteristics, features tailored ‘dual-propeller load curves’ for optimising towing/trawling and free-sailing conditions. SCR is the most tested and approved system for achieving NOx reduction rates up of to 90%. SCR involves the injection of ammonia or urea, into the diesel engine’s exhaust stream. The urea decomposes into ammonia and carbon dioxide, with the ammonia subsequently reacting with NOx and oxygen in the presence of a catalyst, transforming into the ecologically-benign constituents of water and nitrogen. In order to optimise the SCR process at part load, the engine is specified with a turbocharger bypass as part of the exhaust gas temperature system that ensures sufficiently high temperatures. MAN Diesel & Turbo’s SCR system is available in fourteen different sizes, in this way fully covering its entire portfolio of medium-speed engines. The system has been devised as a modular kit of components for reasons of simplicity and to minimise costs. A special feature of the system is its communication with the engine control system that optimises the temperature for the SCR system at individual load-points. A further special feature of the system is its continuous NOx-emission control that saves urea and avoids ammonia slip. MAN Diesel & Turbo also offers customised SCR systems on demand.